Welcome to Kumamoto Kokufu High School. We are very glad to connect with Internet and send a greeting message now. Our school was founded in 1941, when there were about 160 students. But now there are about 1500 students(from 10th grade to 12th grade) and 120 teachers and staff. It is coeducational and we have 3 kinds of courses, which are a commercial course, a computer course and a general course. The students of the commercial course study mainly subjects like soroban (abacus), bookkeeping, typing, basic knowledge of business besides Japanese, English, math, science and so on. The students of the computer course study mainly the advanced knowledge and skill on the computer in addition to the above subjects. 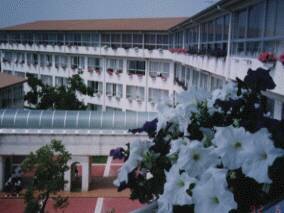 In the general course, they study Japanese, math, English, science and social studies. Our school started to send e-mails by Venus in 1991. We have communicated with some schools in England, Scotland and Australia. 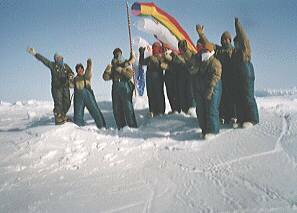 In 1993, our principal and 10 students of our school went to the North Pole area with Masako Izumi (an actress and explorer) and succeeded in exchanging e-mails between our school and the North Pole area. We are looking forward to exchanging email with a lot of people from other countries. Please send your comment to INFO.